Dental restorations — like the patients that need them — come in all shapes and sizes. Recently our founder Angelo Bonafiglia blogged about what can still be accomplished with traditional dentures, and BonaDent remains a great resource for life-like, esthetic removables. But what about those full-mouth restoration patients who think it over and decide they want something a little more permanent? Well, I’d like to introduce you to our PreciZion Bridge. BonaDent’s PreciZion Zirconia Restorations are the perfect solution for a case that requires screw-retained accessibility while also providing superior functionality, durability, and esthetics. Through the use of sophisticated CAD/CAM technology, PreciZion offers the incredible strength of a monolithic zirconia ceramic, along with titanium implant components that eliminate potential for fretting of the hex. 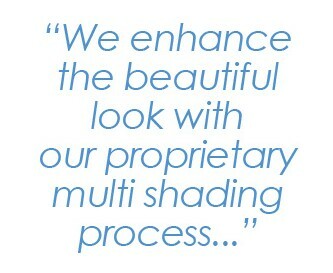 We further enhance the life-like esthetics thanks to our proprietary multi shade process that infuses the zirconia with color prior to sintering. So what do you need to do in office to prescribe a successful PreciZion restoration? You will also need properly positioned implants. This includes no more than 30 degrees of divergence for any implant with a bridge. 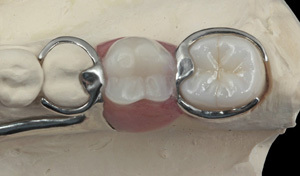 Provide a conventional implant impression using the correct transfer copings as well as an opposing model. At BonaDent, we have a list of specific compatible implants. The full library can be found here. If you are providing a wax-up or study guide (which we highly recommend), it must seat on the articulated model, and be removable from that model, similar to a denture set-up. 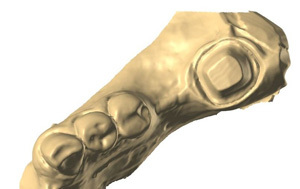 For mandibular cases, a study cast of existing tooth set-up can be utilized. Finally, provide us with a centric bite registration. Once your case is received, we will create the design and send a PreciZion verification bridge milled from PMMA material. This verification bridge will be our blueprint — we won’t fabricate a final zirconia restoration without it. Keep in mind, this process isn’t just for full-arch cases. PreciZion screw-retained zirconia can also be utilized for single units, small and large span bridges, and comes with a five-year guarantee against breakage. So if you’re looking to simplify even your most complex cases and deliver your full-mouth restoration patients the ultimate in long-term comfort and satisfaction, consider prescribing BonaDent’s PreciZion Bridge. Have questions for Heather about how to deliver your patients the best solution with our PreciZion Bridge? Send her an e-mail at fillinginthegaps@bonadent.com. Have you ever tried to fix anything with superglue? You play around with the pieces carefully trying to find the perfect fit because you know you only have one shot to get it right once you’ve put the glue on. When you think you’ve found the sweet spot, you cautiously apply the glue to one of the broken pieces and then slowly press them together knowing that the slightest movement can adversely affect the repair. Have you ever felt the same way when you have to make a crown fit to an existing partial? You just hope to capture the clasps and rests in the right position so that the new crown fits correctly. And you’ve got an added difficulty: how can you manage to retrofit the new crown to the existing partial without unduly inconveniencing the patient? Historically, this process has been accomplished in two ways: in the first, the partial can be picked up in the impression, and can be sent to the lab to be used to create a crown incorporating the partial’s rest seats and clasps. Needless to say, this doesn’t spare the patient at all, forcing them to go without their partial until the process is completed. 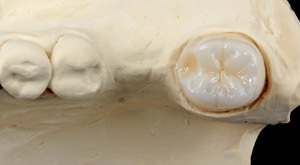 In the other technique, known as the Parkell technique, Blu-Mouse is used to create an impression of a partial over the crown prep. 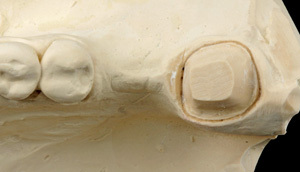 This mini impression is placed over the prep on the stone model to create a duplicate of the clasps using resin. 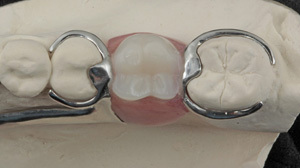 This technique, while allowing the patient to keep their partial, is unfortunately not ideal either, since it can be highly inaccurate if the resin clasp is oriented incorrectly on the model, not to mention that the resin is very fragile and can break easily. So what else can be done? 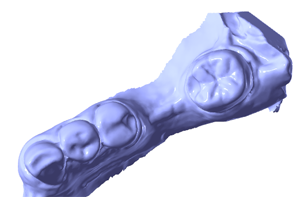 Fortunately, thanks to the beauty of CAD/CAM technology, we have ways to make the process simpler, more predictable, and more accurate. All you have to do in the office is take a pre-op impression of the existing crown and send that in to the lab with the case (Images A & B). Our CAD/CAM specialist then scans the pre-op impression, and merges it with a scan of the prepped die (Images C – E). The data collected from the pre-op can be used to create a new crown by utilizing all the same coordinates to create the rests and clasping that we need (Image F). It is that simple. And the best part is, there is no inconvenience to the patient. Thanks to the enhanced precision of this technique, fitting a crown to an existing partial doesn’t have to be as stressful as it once was. Your patients can avoid the inconvenience of being without their partial, and instead will enjoy long-term comfort and satisfaction while you benefit from additional space in your schedule to fill with new patients and new opportunities for success. 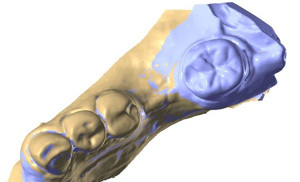 To speak directly to Heather about how CAD/CAM technology can make retrofitting a crown to an existing partial smoother and more accurate, send her an e-mail at fillinginthegaps@bonadent.com.